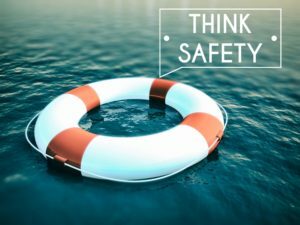 Swim Safety… It Is Everyone’s Responsibility!!! Swim 101>Uncategorized>Swim Safety… It Is Everyone’s Responsibility!!! Often we do not think about the impact of a catastrophic event unless it happens close to home, or unfortunately directly to us. Drowning is one of those events that we never want to impact our lives, but over the past month – it has impacted our community. Losing a high school student to drowning in Oxford over Memorial Day weekend and a near drowning in Metamora where the child needed to be rushed to the hospital… we think those are way too close to home. As co-owners of a swim school, we feel this is way too close to our backyard, but also know it is completely avoidable through education and vigilance. Unfortunately, the United States averages ten drownings per day…yes that is per day! The statistics do not even take into account near drownings, which many go unreported. As we move into our summer, kids now being out of school, attending camps and being near water more often, our anxiety is at a peak. And understand that teens and adults are not exempt. Most definitely, anyone can drown from babies drowning in an inch of water to competitive swimmers. Drowning knows no face, age or nationality. As soon as one thinks they are exempt from this horrible threat, something is bound to happen. So what can the adults do about it? It is pretty simple actually, make sure your child(ren) get swim lessons. Swim lessons aren’t perfect or fool proof, but they can help immensely with knowledge, awareness and safety. Establish a “water watcher” at all events. The water watcher cannot be distracted by their phones, other people or conversations, not even for a second. It is even good to take it one step above and have a rotation of people to share this responsibility to be sure everyone is on high alert during their term. Can we ever prevent a drowning? Unfortunately, no. We cannot predict the situations that may occur but we can put the kids and adults we care about in the most favorable position to help prevent any possible occurrences. Swimming skills are necessary. They should not be equal to “extra-curricular” activities. You will not die if you cannot throw a football correctly or shoot a free throw. Swimming is an essential learned skill that must take place as young as infancy. This will develop comfort and knowledge when one is near water for their entire life. Teaching these skills in a controlled environment will help when in an uncontrolled environment, such as a lake. The lake factor creates anxiety with the addition of fish, seaweed or not being able to see or touch the bottom. At Splash! Oxford Swim School we recommend a partnership with our families, a perpetual swim lesson plan (kids improve at their own pace) and a plan to build knowledge about water safety for a lifetime.